Just about any lock can be broken given enough time to work on it, but now when an alarm sounds upon tampering that is a different story. Here we offer a lock that sounds the alarm if anyone is tampering with it. A lock that protects itself. The moment somebody tries to open this lock without the key, it will sound a 100dB alarm and all eyes in the area will be on it. Thieves rely on blending in and looking innocuous when they do their dirty work. Too bad for them, with this padlock, any messing around with the lock will cause the alarm to blare and bring attention to the thief, just what they do not want. In most cases it will cause them to leave the area. The alarm sounds in 10 second intervals. 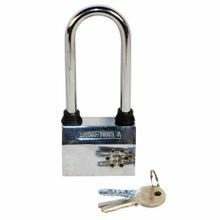 Each lock is heavy duty steel with large hasp and comes with 3 AG13 batteries installed. Batteries are replaceable. Comes with 2 keys. Made of Zinc Alloy with steel shackle. Large weighs 11 oz. Dimensions: 5 �� x 2 3/16� x 1� Shackle rises 3.5 inches above the lock body. The small model just has a smaller shackle that rises 2 inches over the lock body. and weighs 10 oz. The spread on the shackle is 1 5/16 interior dimension for both sizes. Keep your bike, garage door, garden shed, side gate, tool box or locker, boat trailer, boat motor or anything you desire secure with this Heavy Duty 100dB Siren Alarm Padlock.